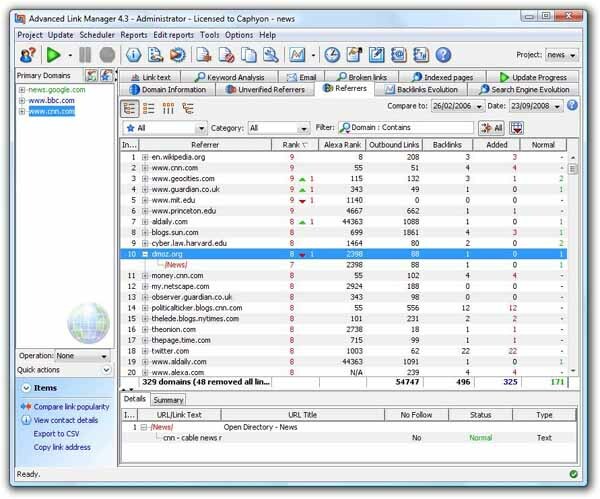 Free download Advanced Link Manager Latest Version.Optimizing your website for the keywords you are targeting is a critical step of your search engine optimization campaign.Advanced Link Manager helps you keep track of incoming links for your website and for your competitors websites at the same time. A reliable SEO software used by the best SEO consultants in the world needs to make link building and management a breeze.Create stunning reports to be automatically send straight to your customers inbox using Advanced Link Manager. Advanced Link Manager stores all the data gathered from search engines on your local computer or server.Keeping tabs on your competition can make a big difference for your marketing efforts and search engine optimization. You can add your company’s professional touch (logo, header and footer) to personalize the reports sent to your customers and transform them into true, high quality and representative products of your company.You can not only add your own header and footer, but you can also use your skills to completely change the way your reports look.